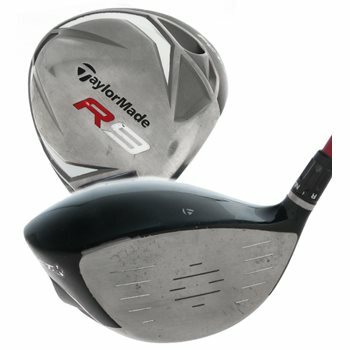 The TaylorMade R9 driver is virtually 24 drivers in one that features Flight Control Technology (FCT) and Movable Weight Technology (MWT) to create complete adjustability for maximum flight control and up to 75 yards of side-to-side adjustability. With FCT, the player may adjust the face angle, the lie angle and effective loft by simple shaft/head adjustments with 8 different clubhead positions to choose from. The MWT allows the player to change the center of gravity (CG) location to promote more accuracy and premium trajectories. It also features TaylorMade''s Inverted Cone Technology which promotes faster ball speeds across the entire face for faster ball speeds and more distance. Its New Classic head shape combines classic and modern lines to create an aesthetically pleasing look from address. The 9.5-degree driver has a 420cc titanium head. "Left" setting is 2-degrees closed with a standard lie angle. "Neutral Upright" setting has a square face and 1-degree upright lie angle. "Neutral" setting has a square face and 1-degree flat lie angle. "Right" setting has a 2-degree open face and standard lie angle.